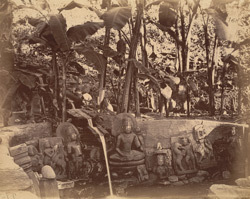 Photograph of a group of Buddhist and Hindu sculptures collected near the spring at Turturia, Bilaspur District, taken by J.D. Beglar around 1874-76. In the Report of his tours of 1874-75 and 1875-76 Beglar wrote, "The stream from its point of issue is led by cut-stone spouts with a gentle slope to near the foot of the hill where it is allowed to pour out in a cascade; the place has naturally been hollowed out by the action of the water into a small shallow basin, which is now surrounded by a brick-and-mud wall, but which once clearly was more pretentiously ornamented by cut-stone bathing ghats and steps, remains of which exist. Within the basin and close to the spout are collected a number of figures Buddhist as well as Brahmanical..."